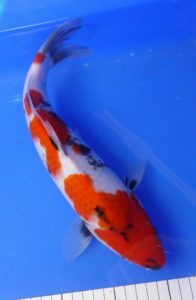 More koi addd to the website. Just one of the many Stunning Quality Female Showas from Takahashi. 33- 34cm approx. NOW ready forsale. Lots of potential, Sumi ( Black pattern) is slowly growing around the head and body.